One of my favorite reads last year was Launching Sheep & Other Stories, which is a collection of humorous essays about history from the perspective of everyday life. It was written by Sarah Angleton, one of amazingly talented writers in the writers guild we both call home—Saturday Writers. To say I laughed my way through reading each of the stories wouldn’t do them justice. They are funny and thought provoking (in a tickle-my funny-bone kind of way) and I think I might have even learned a few historical facts. Should I ever be called up as a contestant on Jeopardy I might be able to hold my own. Since Sarah’s debut novel released last week, I decided that now would be a good time to introduce her to my readers. Her new book, Gentleman of Misfortune, is historical fiction. I’m about a third of the way through it and have to keep making myself get up to take care of all those other things life demands. That means I’m loving it. J: So Sarah, tell us a little about yourself. S: I’m a writer, blogger, wife, mother, book nerd, and history enthusiast from St. Louis. I love rooting for the Cardinals but don’t care for the pizza. J: Ha! I’m just the opposite—I love pizza, but don’t care much for baseball. Which isn’t a good thing when living in the home of the Cardinals. J: I love books that bring me to tears. Is there a book that made you cry? S: I recently read Like a River from its Course by Kelli Stuart, a World War II novel that focuses on the effects of German occupation in Ukraine. It’s a beautiful, gut-wrenching read. It’ll clear out your tear ducts for sure. J: I’ve heard good things about that book, but haven’t read it yet. J: What genre(s) do you write and why? Is there one you’d like to try? S: I primarily write historical fiction because I really love the process of researching. I also sort of stumbled into writing humor as my blog developed. What started as a history blog morphed into part history, part humor, and part personal narrative. I also read broadly and have a soft spot for dystopian fiction. I have written the first in a dystopian trilogy that for the foreseeable future will likely only see the inside of a drawer in my writing office, but it captures my imagination, which for now is enough. J: Ah ha … the ole book in the drawer. Well, I for one, hope it sees the light of day sometime. J: Do you set a plot or prefer going wherever an idea takes you? S: I tend to plot, with a loose, flexible outline that inevitably changes a lot as I work through the first several drafts. If I don’t have some idea of where I’m going, I find I can’t move forward enough to get anywhere. J: I’m more of a pantser—I get an idea and jump, hoping there’s something to grab hold of. J: Who are your favorite authors? Have they influenced your style? S: This is always a tough question to answer because of course there are so many. But I love Anne Tyler for her wonderfully quirky, yet totally relatable characters. I love Graham Greene for his unapologetic use of allegory. No one puts together a sentence like John Updike or is as thorough in his research as James Michener. These are a few of the bigger names I admire. Right now I am fairly obsessed with the YA author Neal Shusterman, whose dystopian light horror is intriguing and chilling and brilliant, and I think the dark and luscious work of Dianne Stretfield is just amazing. I have never intentionally mimicked another author, but I do believe that everything I read influences how I write, and that the more I read, and the more widely I read, the better writer I become. J: I totally agree with that—I also read widely and deeply in a variety of genres. Doing so improves my skills. Interesting you should mention Neal Shusterman. I had the delightful privilege of meeting him at a writing conference in 2017 where he was one of the keynote speakers. I purchased his novel, Challenger Deep, which is one of the best depictions of mental illness I’ve ever read. He wrote it after his own son was diagnosed with schizophrenia when he was only 16. The artwork in the book is his son’s. J: How much of yourself do you put into your books? S: My books certainly reflect my interests and my general personality and sense of humor. I think if they didn’t, I’d have a hard time communicating with my readers. But I have never knowingly based a character on myself or anyone I know, or based a plot upon any part of my real life. J: I actually have in a couple of instances. In my debut novel, there’s a dog named Cooper, who I developed after a friend’s dog’s story. And there’s also an Italian gentleman who is loosely based on a friend. But he knew I was including him and was cool with it. J: Do you have a favorite Indie author? S: I admire the work of J.J. Zerr. His writing has a snappy sort of rhythm that’s really fun to read and he spins fascinating tales. J: I’ll have to check him out. So, tell the readers about your latest, Gentleman of Misfortune. 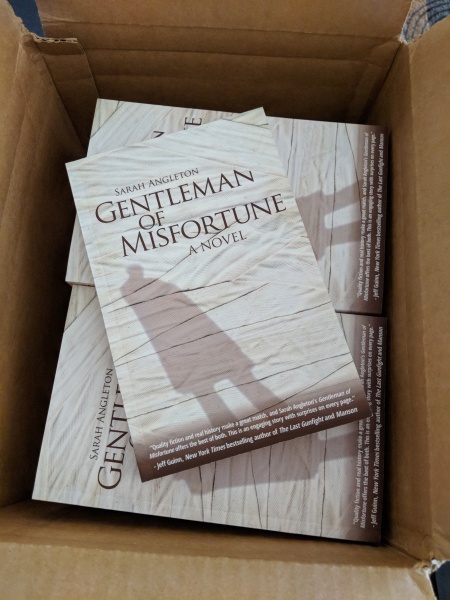 S: Gentleman of Misfortune is the story of nineteenth century gentleman swindler Lyman Moreau, who finds his next big scheme and loses his heart among a shipment of mummies bound for the most successful prophet in US history. I was delighted when Jeff Guinn agreed to review it. “Quality fiction and real history make a great match, and Sarah Angleton’s Gentleman of Misfortune offers the best of both. This is an engaging story with surprises on every page”. — Jeff Guinn, New York Times bestselling author of The Last Gunfight and Manson. J: What inspired Gentleman of Misfortune? S: It’s historical fiction, so it follows a real story in which eleven mummies were shipped from the Valley of the Kings to New York. The shipment was claimed by a man who identified himself as the nephew and heir of the Egyptologist who discovered the mummies and died shortly after. The supposed nephew, Michael Chandler, displayed the mummies across several states, and eventually wound up in Ohio with four of them and a few pieces of papyrus covered in hieroglyphs. This remaining collection, he sold to Joseph Smith, founder and prophet of the Mormon Church. The problem is that no one has been able to find a connection between Chandler and the Egyptologist or explain how he came to possess the mummies. When I came across this story, I had already written a related novel and in it, I had a minor character named Lyman Moreau, who was screaming that he had a larger story to tell. As I thought about it, it made a lot of sense to let him step in and assume Chandler’s identity and carry a novel as the leading man he seemed born to be. The other novel was unfortunately caught up in a conundrum with a small publishing house and so will be arriving on scene second instead of first, which I imagine makes Lyman pretty happy. J: What is your favorite quote from Gentleman of Misfortune? J: What are you working on now? S: I am currently knee deep in research for a historical novel that will explore the stories of missionaries to Liberia in the 1830s and 40s. J: I love how you find such interesting topics to write about. J: Do you hide secrets in your books that only a few people will find? S: I don’t know that I hide secrets, but because I am writing historical fiction, I try very hard to do all my homework and place the little tidbits that will allow someone who really knows the specifics of the era or the historical details I’m using to understand and appreciate the work that has gone into creating the appropriate world for the story. Of course there’s always going to be that expert who catches the one mistake you make, but a little extra effort goes a long way to toward balancing out the inevitable errors. J: Sarah, thank you for spending some time with my readers today. I believe you have a special giveaway to announce? Where can readers follow you and your work? Thank you so much, Jeanne! I’m so jealous that you’ve met Neal Shusterman. WOW! Look at that blurb from Jeff Guinn! 🙂 That is fantastic. You are doing amazing, Sarah. Can’t wait to see what’s next. I like how you do your interviews–with the comment after hers. I think you gave me a new idea. Thanks, Margo! Truthfully I have no idea what I’m doing.